Welcome to the historic Homestead at the Dripping Springs. We want to let you know a little about our bed and breakfast. Each of our three dwellings is unique to their time period, style, and setting. We are centrally located in the Historic District of Dripping Springs, yet close to shops, wedding venues, wine trails, parks, and beautiful country roads. This historic site in downtown Dripping Springs was established in 1854 by John Moss, whose wife is credited with giving our community its name as tribute to the dripping springs located on the property. In 1871, B.J. Marshall moved the frame section of the main house to it current location and added a rock portion. Mr. Marshall became postmaster for the community and operated the post office out of the home. 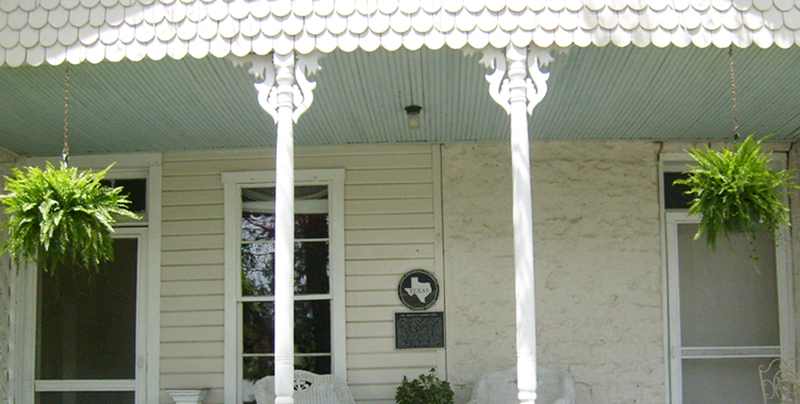 The Homestead was the stagecoach stop for the Austin to Fredericksburg postal route. Unfortunately, Mr. Marshall’s tenure as postmaster and master of the Homestead was short lived as he passed away in 1872, and Mrs. Marshall remarried to W.T. Chapman. It was Mr. Chapman who laid out the town site for Dripping Springs, and Mercer Street is named for their son, Mercer Chapman. The Marshall-Chapman clan owned the property until 1942 when John W. and Clara Wilson purchased the home and surrounding 77 acres. Today, the property remains with the Wilson descendants. Also on the property, sitting just to the east of the main house, affectionately known as “Clara’s House,” is the Butler Cabin. Although not an original part of the property, this historic cabin was built in the 1850s about four miles east of Dripping Springs. It was moved to its current location at the Homestead in 2007. In 2016, Willie Mae’s Cottage was built just west of Clara’s House. Our new cottage is named for Willie Mae Wilson Haydon who is the mother of current owner, Charles Haydon. She lived on the property with her family, John and Clara Wilson, in Clara’s House during the 1930s. Willie Mae’s Cottage is constructed of rock salvaged on the property from the old smokehouse. The cottage is built similar to Clara’s House with thick, rock walls and board/batten construction. Many architectural artifacts were used to create a comfortable space reminiscent of the 1870s. For more information on the Homestead, please do not hesitate to contact us.